Hello!!! 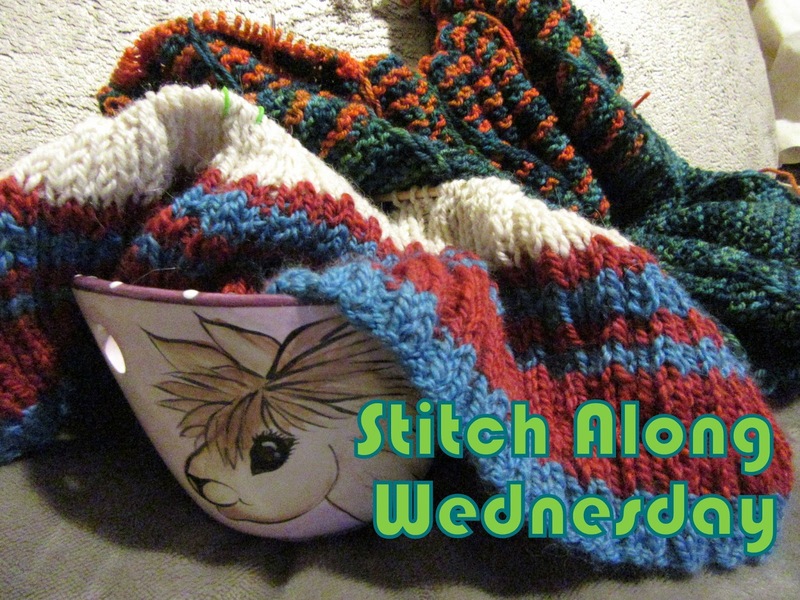 Happy Stitch Along Wednesday - Tuesday night....the Hubs just asked why I posted it on Tuesday..and I said, "So I don't have to do it Wednesday morning"...and he said, "But it's Tuesday"...to which I replied..."It's Wednesday in some parts of the world. "...he said, "You got me there.."
::sigh:: I just finished reclaiming about 700 yds of Malabrigo Chunky from my Freeport Vest. I might make it again in a smaller size but I doubt it. In the WIP world, socks socks socks...and a sweater. I think that's it for right now. That might change, however. I'm gunna link up this week, darnit! :P though my projects are kinda meh. That was a good answer. :) Your projects look lovely. I finally got around to spinning with some of my handspun yarn. The past month or so, I've mainly been spinning. Since moving to a much larger home, I now have a "craft room". So, some weeks ago I was working on whipping it into shape (an ongoing WIP...) and came across no less than 1 dozen small and two large projects that were unfinished. See my latest blog post for the list! I'm almost caught up on my WIPs for some reason. If I take action on the things piling up in my Ravelry queue, that could change very quickly. Suddenly I'll be ankle deep in socks.